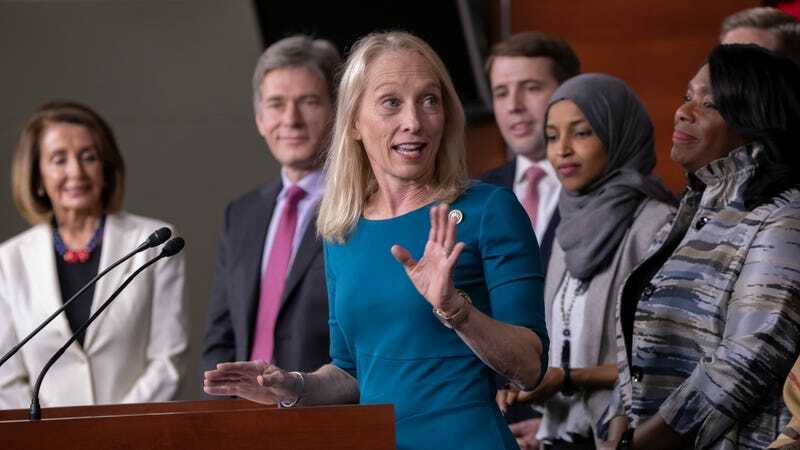 Recently sworn in, Rep. Mary Gay Scanlon of Pennsylvania is among the list of Democrats who’ve stated they will not support an effort to overturn the FCC’s decision in Congress. Under the Congressional Review Act (CRA), Congress could undo the controversial FCC rules passed in a party-line vote last December, which effectively reversed the 2015 Open Internet Order that had established net neutrality principals as federal regulation. In May, the U.S. Senate passed a CRA resolution for this purpose with the aid of three Republicans. Unfortunately for supporters, the CRA rules for the House and Senate differ in one significant respect: In the Senate, a discharge petition—that which forces a vote on a CRA resolution—only requires 30 signatures, a threshold far below a majority. In the House, however, a majority, or 218 signatures, is required before a vote can be called. As it stands, only 180 (overwhelmingly Democratic) lawmakers have signed the House discharge petition. But the resolution must be brought to a vote by year’s end, or else it gets squashed. The technical deadline to gather the remaining 38 signatures expired yesterday, on December 10; however, the prolonged battle over government funding between the White House and the Democrats, who will shortly control the House, has effectively extended that deadline until December 21. Forcing a vote in the House is seen by some net neutrality proponents as a victory in and of itself, regardless of the outcome. It would compel many lawmakers who’ve remained silent on the issue to cast a vote either in support of or against the policy, establishing a record of their position, which could easily serve as ammunition next campaign season. Net neutrality activists—and in particular, the organization Fight for the Future—have formed campaigns to target those Democrats who’ve yet to sign the discharge petition. Outside Washington, net neutrality enjoys significant support from both Democrat and Republican voters. Inside, however, it remains a mostly partisan issue. Activists attribute the silence of the 17 House Democrats to “fistfuls of money” (campaign contributions) from telecom lobbyists. The website demsagainstthe.net, established by Fight for the Future, chronicles the amounts of money received by Democrats who’ve yet to sign the petition and encourages constituents to contact the lawmakers and question them about their position on net neutrality. Scanlon, whose campaign issue page featured a now-deleted section promoting net neutrality, also echoed a common telecom industry talking point: That net neutrality should only be addressed through congressional legislation, and that it should not fall under the purview of federal regulators—even though the FCC’s ability to enact administrative law stems entirely from legislation passed by Congress. This argument is oft-used by Republican lawmakers and net neutrality opponents when attempting to derail congressional efforts to overturn the FCC’s decision. Scanlon’s office was not taking calls on Tuesday, citing a move to her new office. Her communications director, Gabby Richards, did not immediately respond to a request for comment sent by email. Update, 12/12: A helpful reader has pointed out the fact that, while Comcast was Rep. Mary Gay Scanlon’s 2nd highest donor in 2018 (at $45,100), the first is law firm Ballard Spahr, Scanlon’s employer prior to seeking office. Ballard Spahr contributed $239,974 to her campaign, according to the Center for Responsive Politics. Ballard Spahr has also represented Comcast in connection with multiple legal matters, including the construction of a $1.5 billion technology center in Philadelphia and a 2014 anti-trust lawsuit, in which Comcast settled for $50 million. Scanlon’s husband, Mark Stewart, is chairman of Ballard Spahr.